Contemporary design with matt black finish. Suitable for burning logs with log grate and metal poker tool included. Patio heaters, fire pits and log burners make your barbecue party go on longer into the evening. 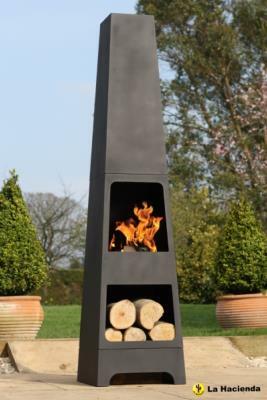 Planet Barbecue offer a quality range to include cast iron chimneas / log burners, steel fire baskets and patio gas heaters. Most enable you to barbecue and include grills to cook over the embers.